Did we tell you we have a book out? The title is Mom & Pop Brooklyn, and it is published by the good people at Herb Lester Associates. This handy pocket-sized guide lists 99 restaurants, bars, coffee houses, pork stores and delicatessens with deep roots in Brooklyn. Each shop is fully tested and approved by Grade "A" Fancy. All of them have been in business at least thirty years, and some go back a century. It's our little love letter to folks holding back the tide of boring corporate homogenization. You can find it at select independent booksellers here in the city, or internationally at the Herb Lester site, or even Amazon, if you must. Recently we got a plug from no less than the New York Times' own Florence Fabricant. Not too shabby! Read it here. Then run right out and buy a copy. Or six. Get all your holiday shopping done before Halloween. 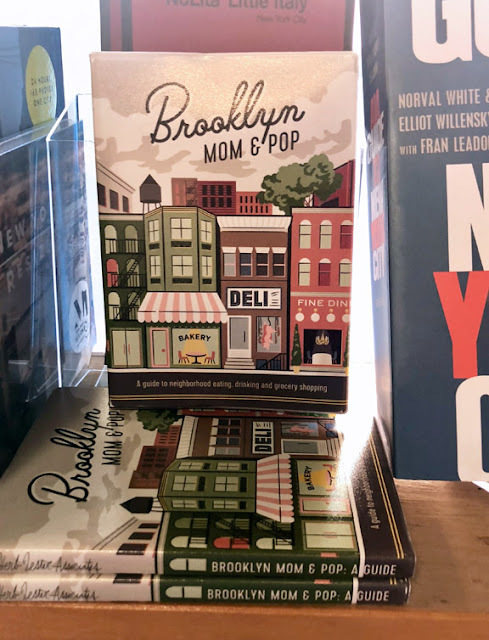 Here is a display at Idlewild Books, 170 Seventh Ave. South in the Village, one of the fine booksellers where you may purchase Mom & Pop Brooklyn. Just tell 'em Grade "A" Fancy sent you. They won't have the foggiest idea what you are on about!